The last remaining picture tube rebuilder in the United States, Hawkeye, closed its doors in 2010. RACS, the last rebuilder in Europe, ceased operation in 2013. Now that they are gone, there is no place to get tubes for vintage TV sets rebuilt. More importantly, the techniques for rebuilding these tubes will be lost forever. 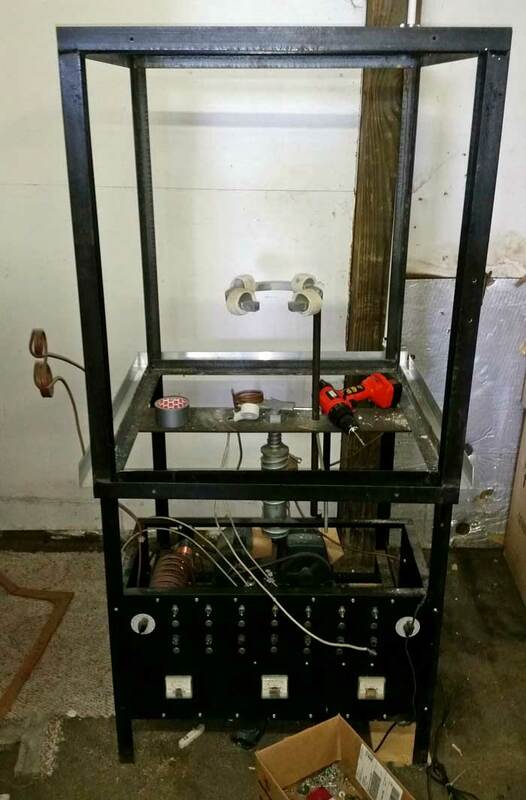 Here is other recent activity on CRT rebuilding and a video about rebuilding by Bob Galanter. 1. Finding a person or person who is willing to devote the time to learning the process. 2. Finding people who will coordinate the project, both now and in the future. 3. Raising the money needed to get started. 4. Solving economic issues. On the expense side, the cost of insurance, utilities and supplies must be considered. On the income side, we need to understand what tubes can be rebuilt at a cost that collectors are willing to pay. We are in the process of doing an inventory of the supplies we received from RACS. A preliminary count shows that we have about 350 12mm cathodes, 200 9mm cathodes, 150 6.3v 600ma heaters and 100 6.3v 300ma heaters. There are also several hundred getters and lots of glass. A full report will follow in a few weeks. We finished 2014 with a balance of $1,783 in the RACS Fund, and a negative balance of $955 in the in CRT Rebuilding Fund. The RACS equipment is now at the museum. It arrived today undamaged. 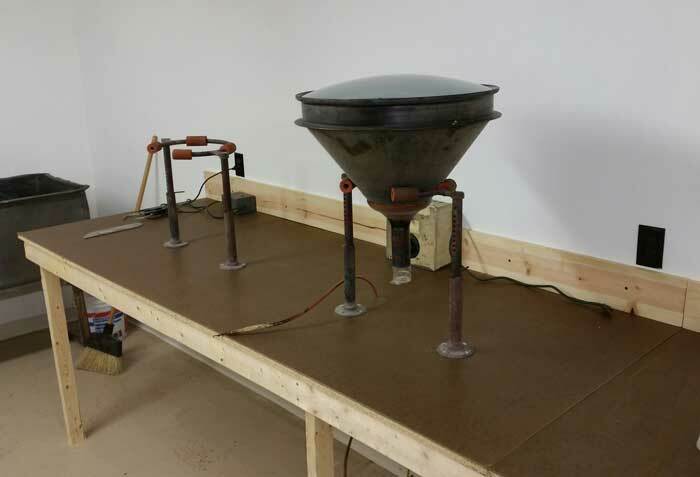 Activation/Ageing timer: We have partially completed the station for activation and ageing the cathode. It consists of two rows of 5 timers, triggered sequentially. 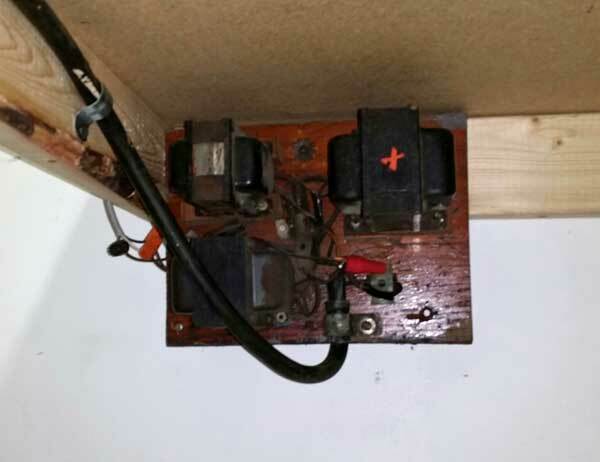 This will apply different filament voltages to the CRT after it is rebuilt. 3 timers have been installed. The others are on order. The pusbutton starts the sequence. For activation, here is the sequence: 5.5 v for 5 min, 7.5 v for 5 min, 9 v for 5 min, 12.5 v for 1 1/2 min, and 7.5 v for 10 min. For ageing: 6.3 v for 1 min, 12.5 v for 1 1/2 min, 9 v for 10 min (with voltages applied to other elements of the gun), 7 v for 10 min, and 6.3 v for 5 min. Here is an article that describes what this does. Bombarder: We fired up the bombarder. Since we have no instructions on how to set it up, we have to experiment. 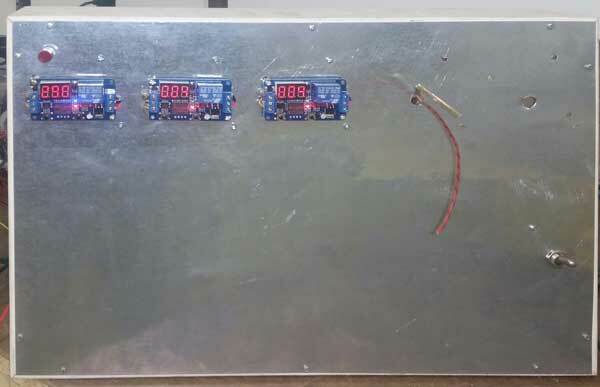 The bombarder is a low frequency high power oscillator that feeds three heating coils: two used for getter flashing and one to heat the gun inside the oven to aid in outgassing. 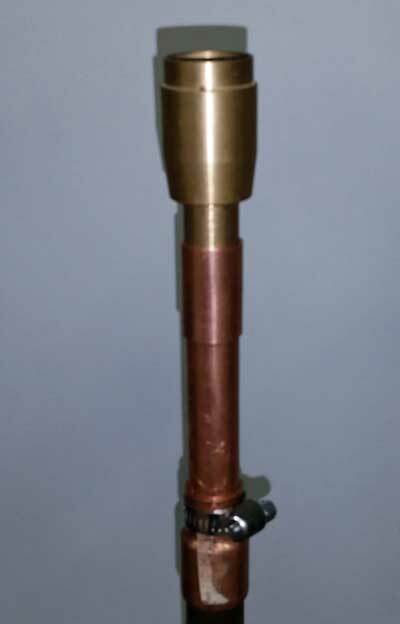 The power output of the bombarder is controlled by the filament voltage applied to the oscillator tube: 8 v for gun heating and 10 v for flashing. 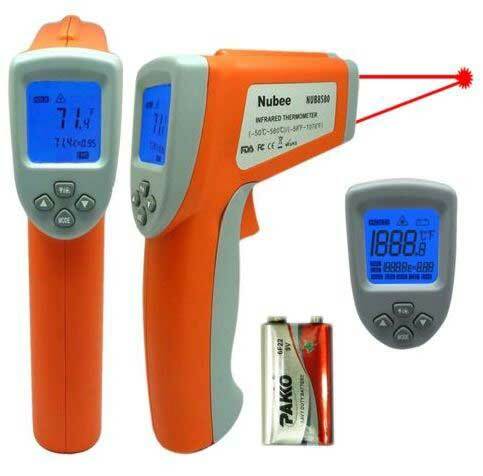 For gun heating, we need enough energy to get the gun to glow a dull orange. Top view. Timer modules are at the center.The oscillator tube can be seen behind them. 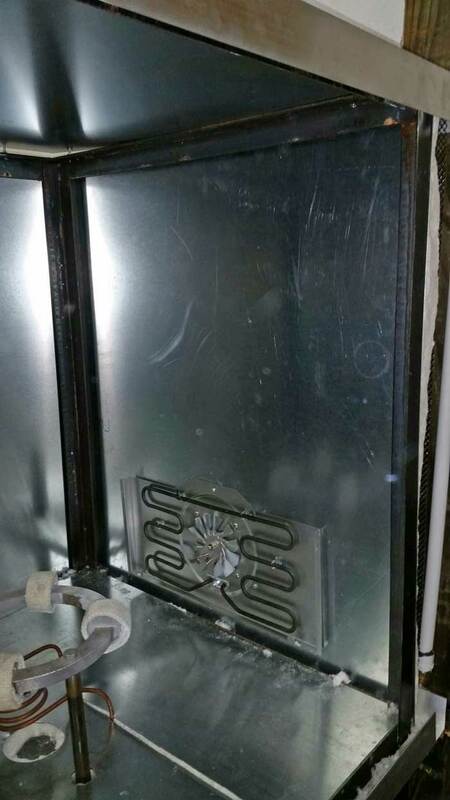 The tank coil is at the right. We were successful in getting the gun to glow in the getter flashing coil, but not in the oven. We will try removing some of the metal in the bottom of the oven which might be sapping the RF energy. 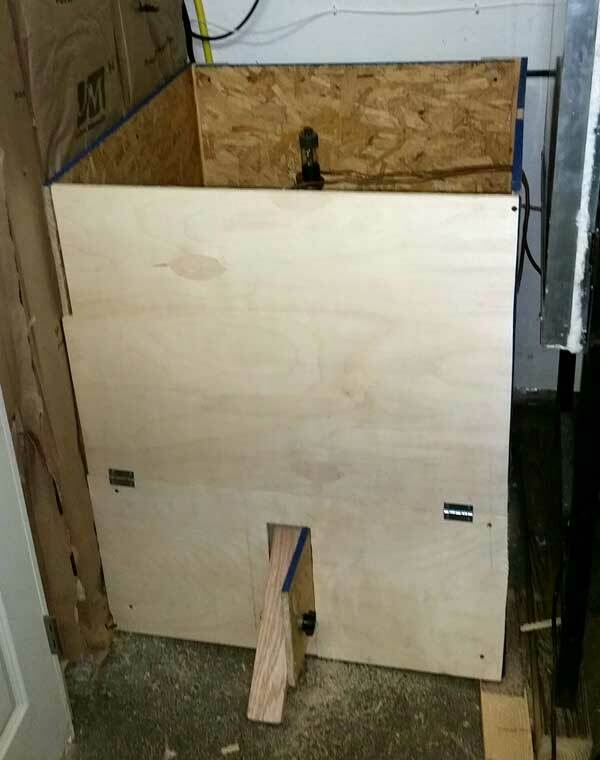 Getter flashing station: We have built a station for flashing the getter. 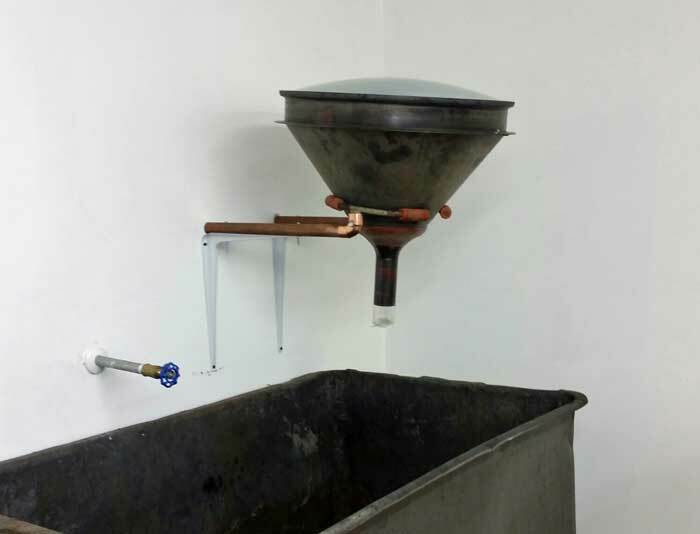 It consists of a box large enought to hold a 30BP4, with a mechanism to position the tube inside the bombarder coils. The station with the tube. The bombarder flashing coils are at the top. 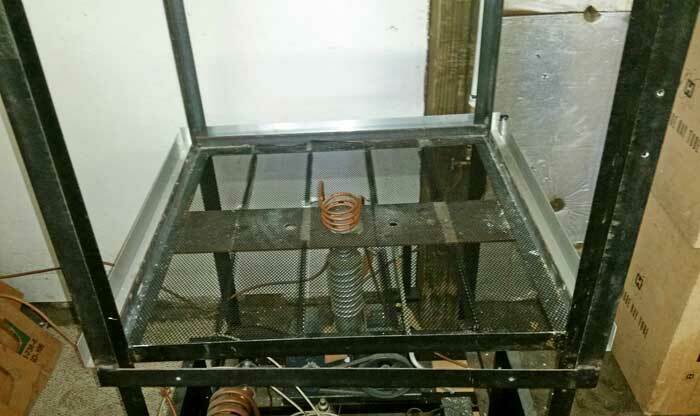 The foot pedal at the bottom raises the circular platform. Then the door is closed to protect the operator from a possible implosion. The RACS equipment is halfway across the Atlantic. It should be in Norfolk on the 26th, then in Hilliard by about December 1. 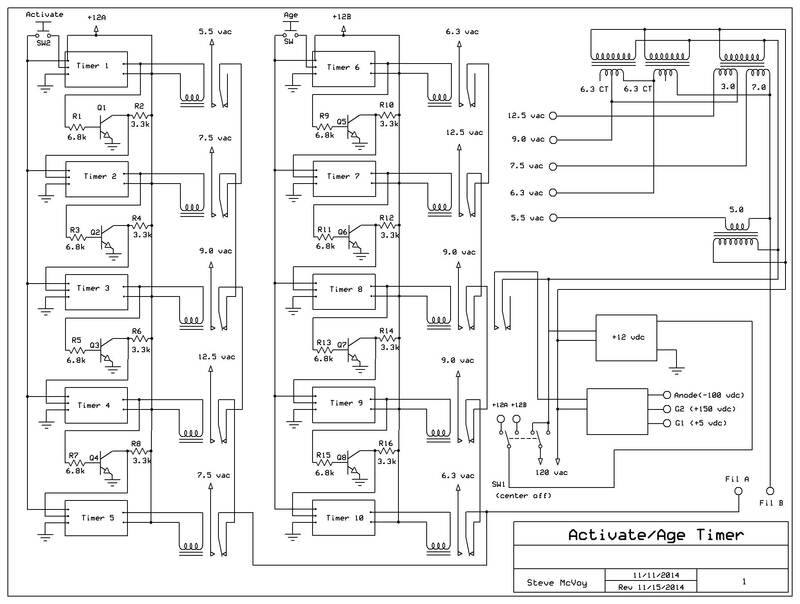 Cathode activation/ageing: Here is a schematic diagram of the controller. Bombarder/controller: The unit that comes with the Color Champion contains circuitry to activate/age the cathode, a bombarder for heating the gun and getter flashing, and control switches to operate the pumps and other functions. 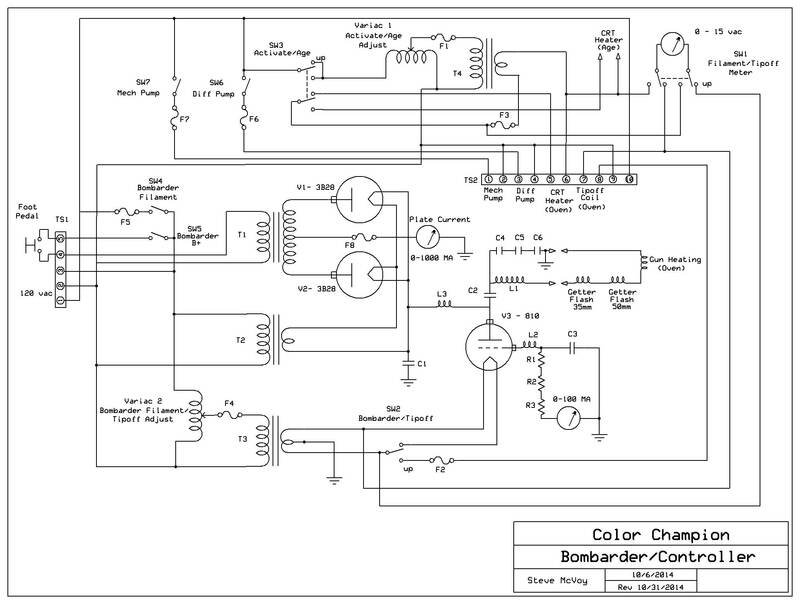 Here is the original schematic. 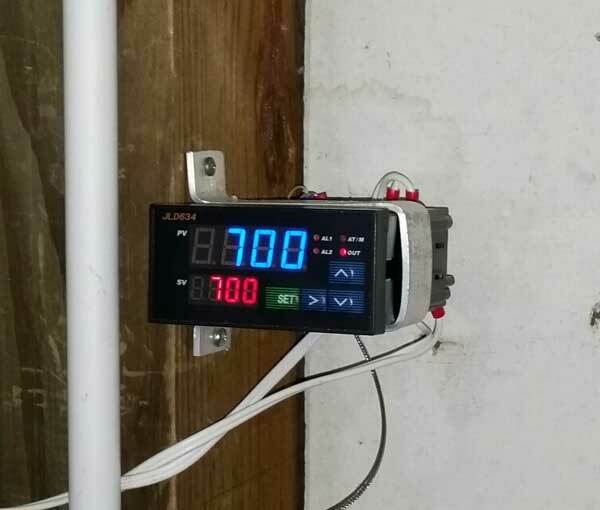 Because our operation will do the activation and ageing outside of the oven, and in order to have the gun bombarding and tipoff procedures controlled by timers, we have rewired the unit. 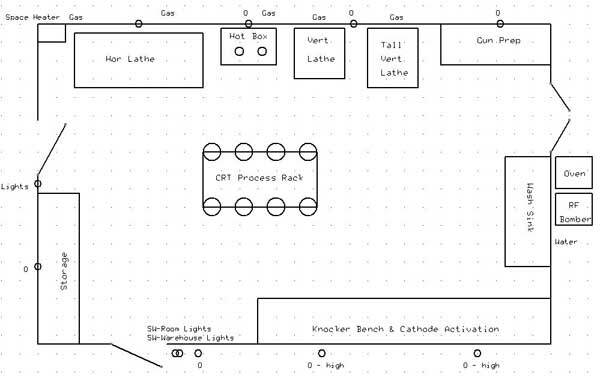 Here is a revised schematic and preliminary operating instructions. 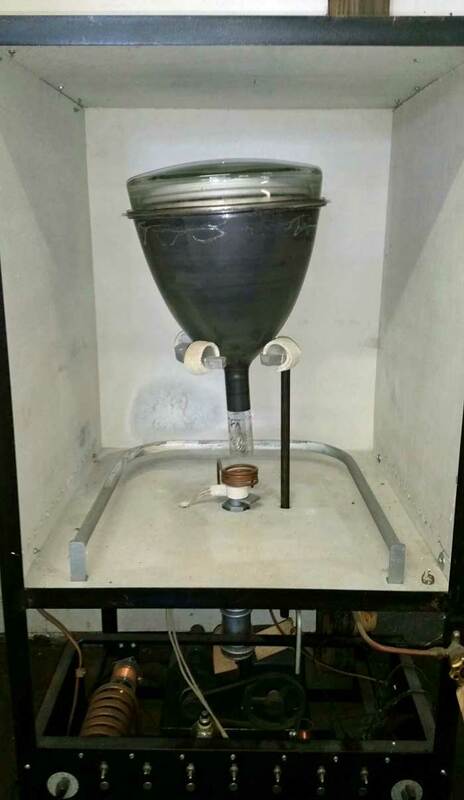 Diffusion pump: We have received the acetone and alcohol for cleaning the pump. We now need to find sources for replacement O rings and copper washers. Here is the cleaning procedure. Because benzene is a carcinogen, we will use isopropyl alcohol instead. RACS Shipment: The container is ready to ship, but we still don't have our customs bond. Once that arrives, it can be shipped. 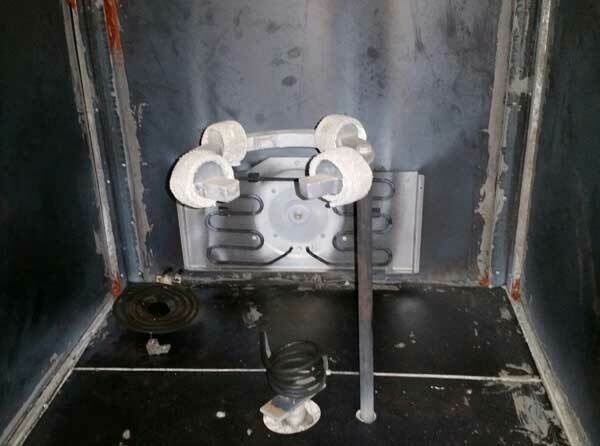 Oven: We added a 1500 watt stovetop element to the oven and installed a better system for sealing the door. Today it took only a little over an hour for the oven to reach 700 degrees F.
Getter Flashing: The Color Champion has two coils, one for 30 mm necks and one for 50 mm. 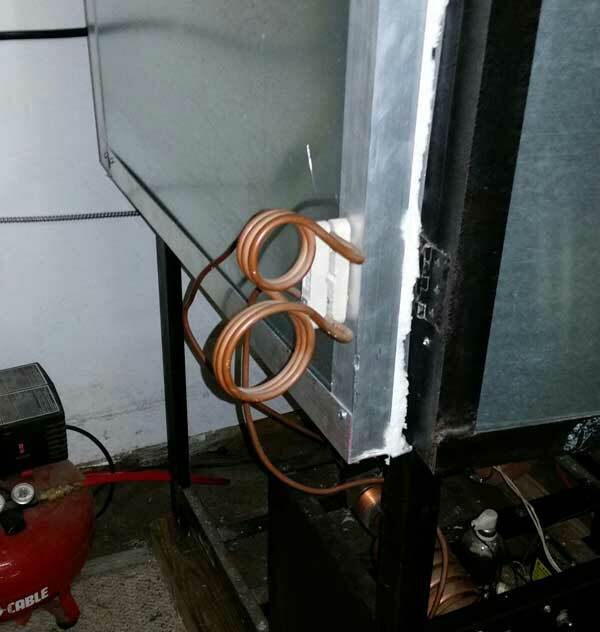 They are located on the side of the oven and the worker would hold the tube in place for the flashing. We think this is a poor and dangerous idea (the tube might implode). So we have another approach. We will build a box about 32 x 32 x 18 inches high with an open top. The tube will be placed face down in this box. The heating coil will be moved down over the neck of the tube near the getter. Cathode activation and ageing: We are building an automated device to do this, using ten $4 timers. They will be set up in two strings; 5 for activation and 5 for ageing. Each timer will apply a different filament voltage to the CRT for a different time. A pushbutton switch will start each sequence. Filament transformers salvaged from Hawkeye equipment. The timer is in the foreground. The front of the machine. Two rows of 5 timers will be attached, with a pushbutton to start each sequence. The big news is that the RACS equipment is now loaded in a 20 ft container for shipment. We expect it to leave France in a couple of weeks. Included in the shipment will be the equipment for re-phosphoring and aluminizing, a large stock of guns and other supplies, and the 15GP22s that were sent to them from collectors in the US. 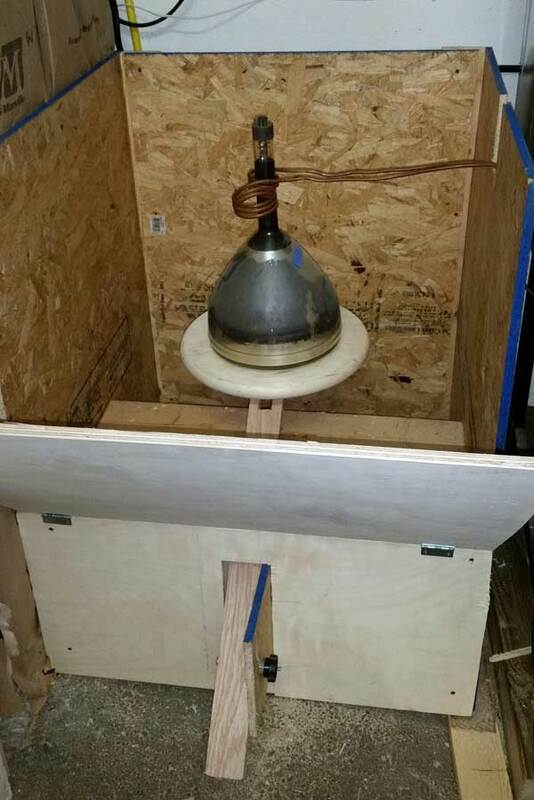 Lathes: Dave May came down and installed the gas line to the room. 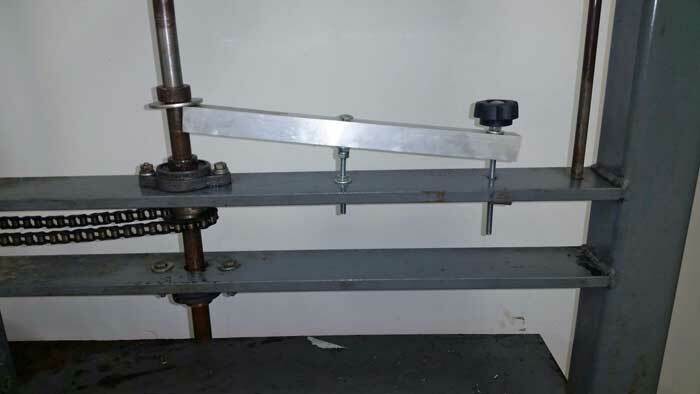 We have completed the connection of the gas and oxygen to the lathes. Max has completed repairs on the gas jets on the Champion lathe and they work well. Next is to test the Hawkeye vertical and horizontal lathes. Oven: We are still working on getting the temperature up to where it needs to be. Gasket material was installed on the door, but we didn't have enough to finish it. Additional gasket is on order. 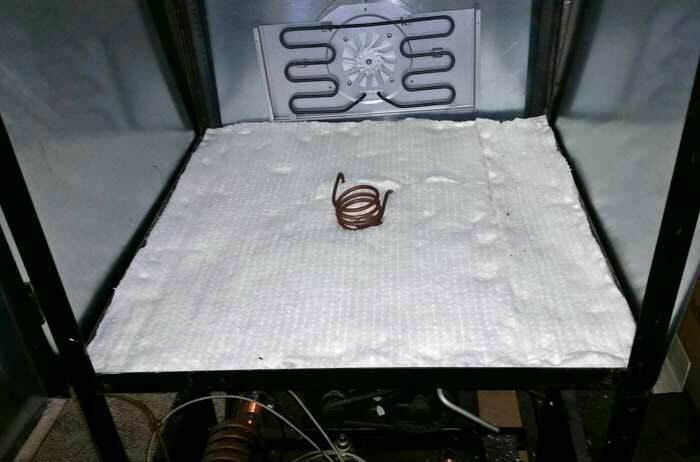 We have also ordered a 1000 watt heating element to add to the oven. Max successfully programmed the timer. Misc: We received a scoring tool to scratch the neck glass for cutting. 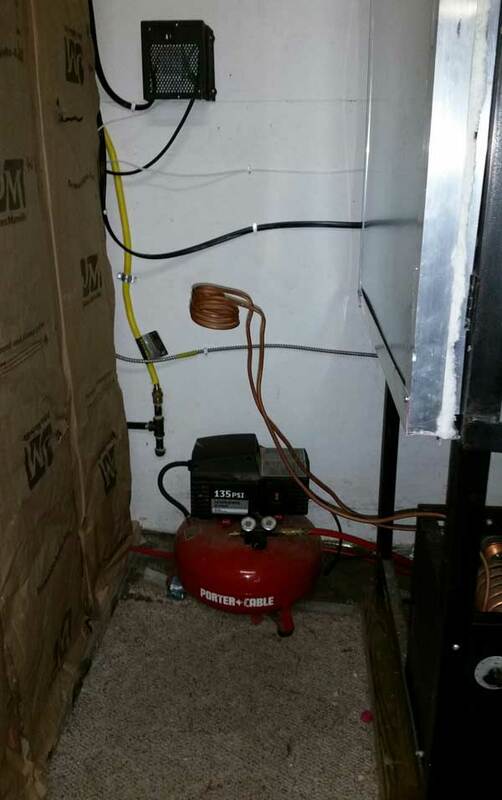 We also received a gas space heater for the room, but it is defective and another one will be shipped to us. Oven: When we first fired up the oven, it would only reach about 500 degrees F. This was because of air leaks near the top of the oven, allowing a significant amount of cold air to enter the bottom and hot air exit the top. We have aded more bolts to hold the steel sheets closer to the frame, and will install gasket material to make the oven as air tight as possilbe. This will allow it to reach the required 700 degrees F in a reasonable time. We have been able to get the temperature controller to work. Inside the oven. The bombarder is below. Lathes: We are in the process of getting suitable hoses for connecting the oxygen and gas to the lathes. Dave May will be coming down next weekend to extend the gas line from our furnace to the room. 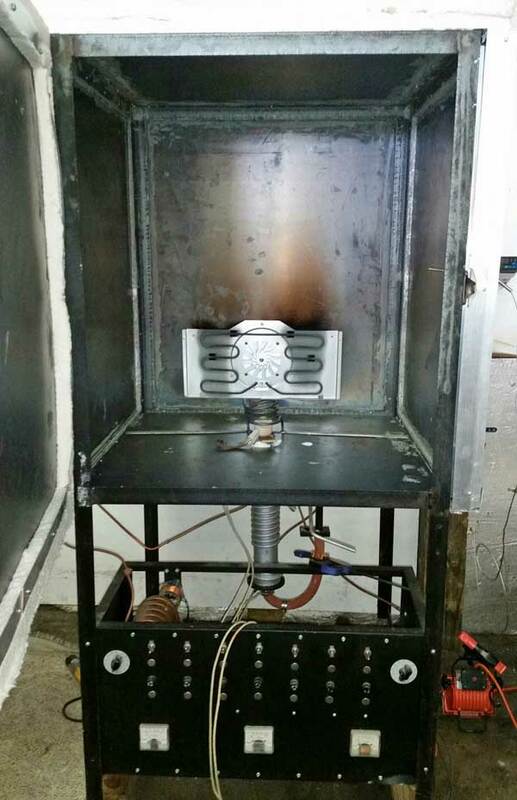 Oven: We have replaced the galvanized steel with bare steel and the oven is now complete. Next is to install the controller. 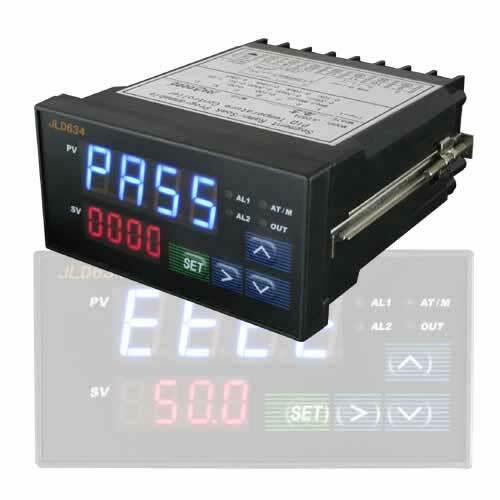 A thermocouple is placed in the oven, and the controller can be programmed with up to 64 different time/temperature increments. 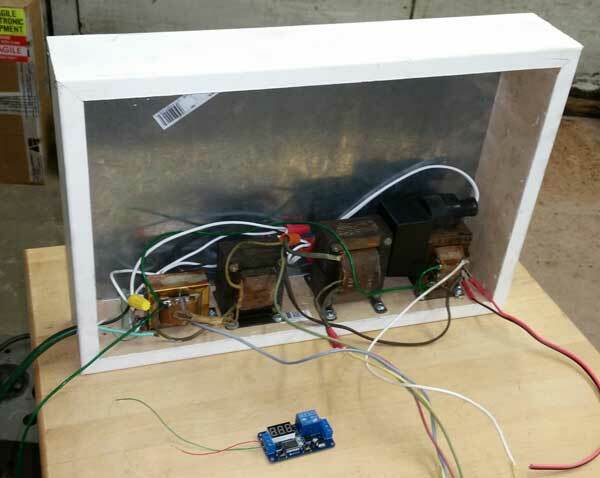 The output feeds a 40 amp solid state relay that controls the oven heating element. We will be firing the oven up soon to make sure it reaches the proper temperature in a reasonable time. 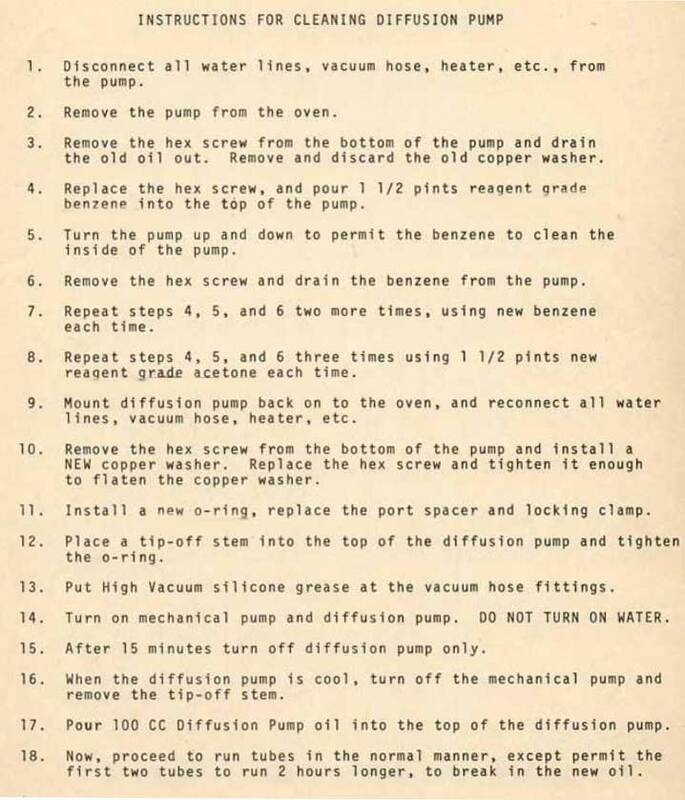 We also need to clean the mechanical and diffusion pumps and test them to make sure we have the proper vacuum. 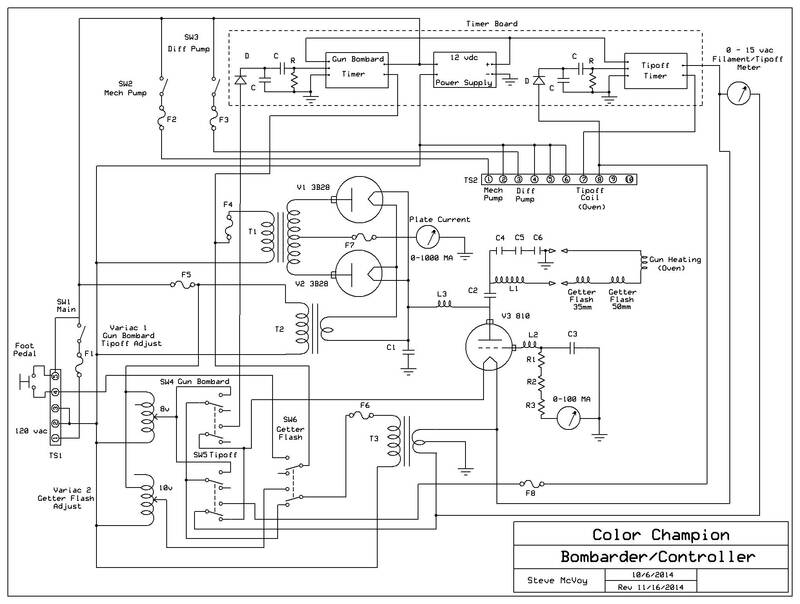 Bombarder/Controller: We have checked the actual wiring of the unit against the schematic that came with the Champion and noted the differences. Next is to test it. The steel shaft on the Champion Lathe (lower) will be tapped to allow a bolt to be installed. 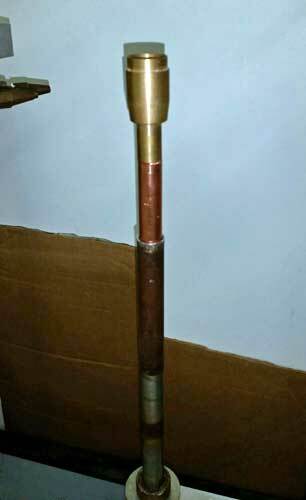 The copper tubing can be moved up or down to set the approximate height of the stem and the bolt tightened. At the top is the chuck to hold the stem/gun. 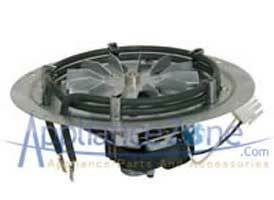 Cathodes and heaters are available from Glowtronics in India. Once we are certain that we can get the remaining parts we will place an order for as many as we can afford. Oven: The ceramic insulation arrived and we started installing it on the oven. The outside of the oven. The mesh holds the insulation in place. 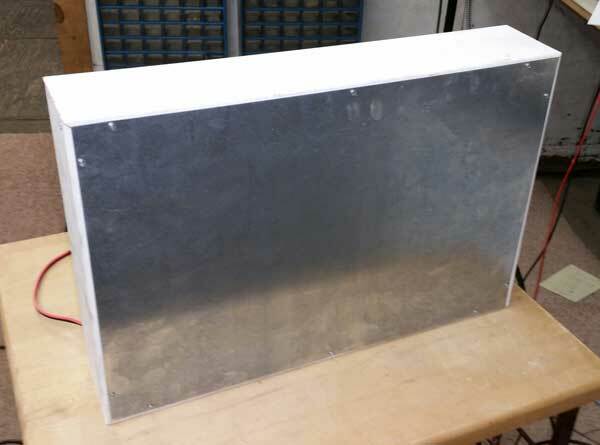 After we have installed the sheet metal, insulation and mesh on the other side and the top we will wrap another layer of insulation around the top, sides, back and bottom. 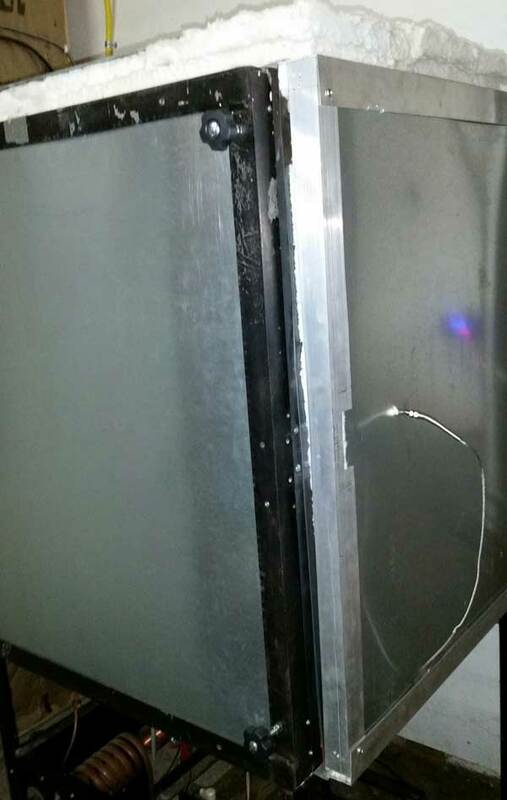 The door will have two one inch layers of insulation sandwiched in between sheet metal. Oven: We continue work. 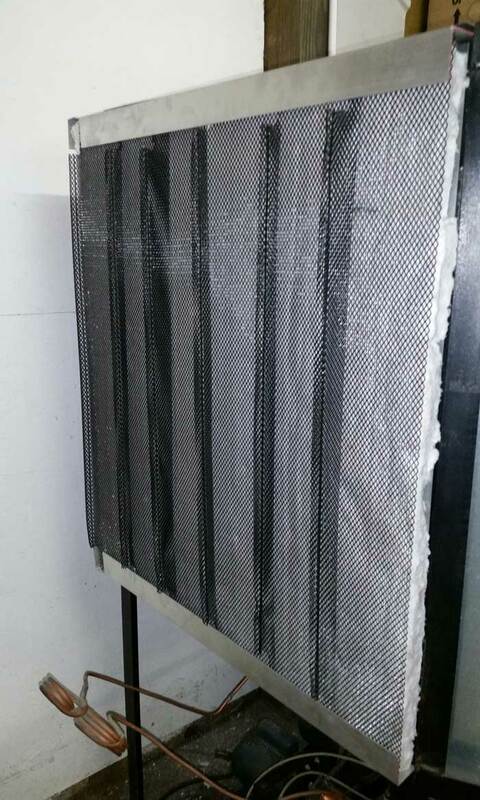 We are using metal gutter guards as support for the ceramic insulation. It will also serve as protection in case of a tube implosion. Here it is on the bottom. Lathes: The lathe that Hawkeye used for welding the button and gun into the neck is not ideal. In it, the CRT is stationary and the gas jets rotate around the glass. This sometimes results in faulty sealing of the glass. A better approach, used by RACS, has the the tube rotating and the gas jets stationary. For this reason we are using a vertical lathe that came with the Color Champion one man CRT plant. 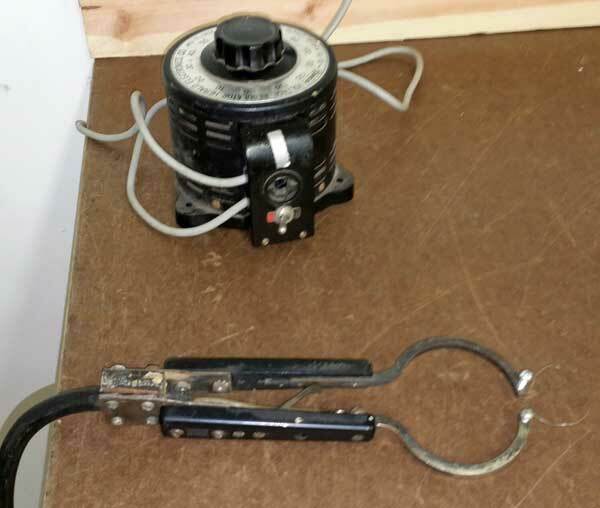 However, it doesn't have a way to move the chuck that holds the neck glass extension and the stem/button/gun assembly up to mate with the neck tubing during welding. 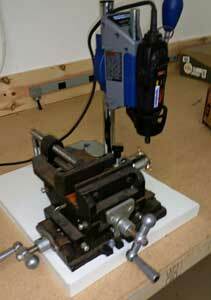 We have come up with a way to modify the lathe to accomplish that. 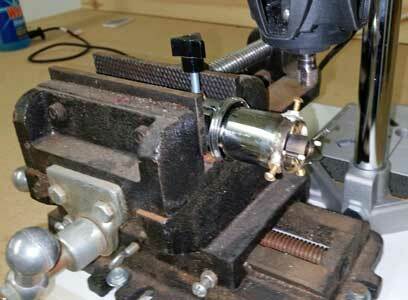 In addition, the lathe is too low to allow the welding to be done conveniently. We have built a platform to raise it 18 inches off the floor. We've removed the tall lathe that Hawkeye gave us, since it doesn't seem to be useful in the rebuilding process. The CRT bench with pressboard on top. At the left rear is the tool used to cut the neck. 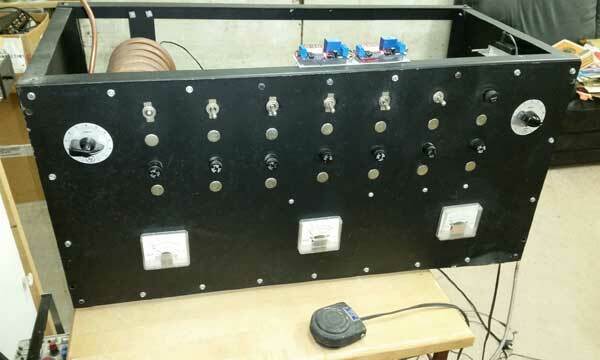 At the center rear is the controller for applying high voltage to the tube to prevent arcing. 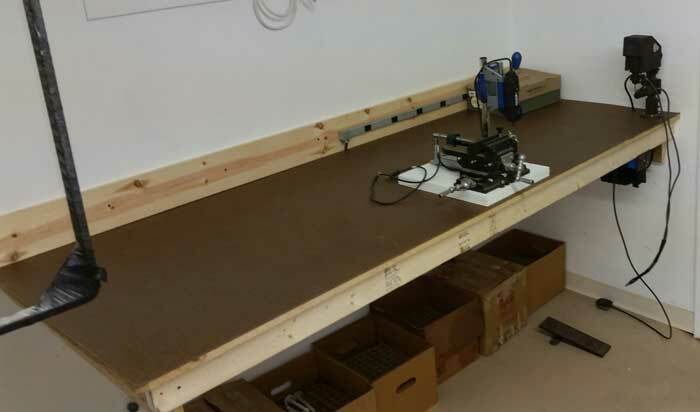 The gun bench with pressboard. At the right is the spot welder. In the center is the jig to hold the gun whille removing the cathode. Aluminum brackets are being added to hold the ceramic insulation material to the outside of the frame. When completed the oven will be large enough for a 30BP4. 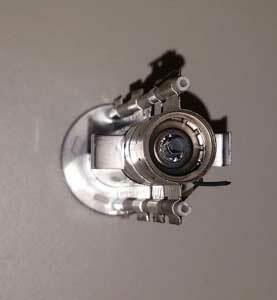 The silver tubular item in the center is the diffusion pump. The bomber/control panel is at the bottom. 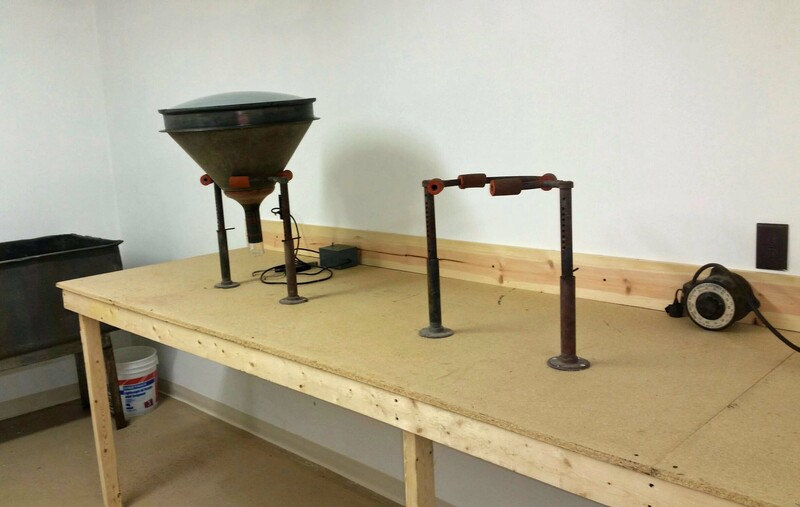 Workbenches: We have installed two benches - one for gun work and one for CRT work. The gun bench. at the far end is the spot welder. There will be a desk lamp with magnifier next to it where gun work will be done. 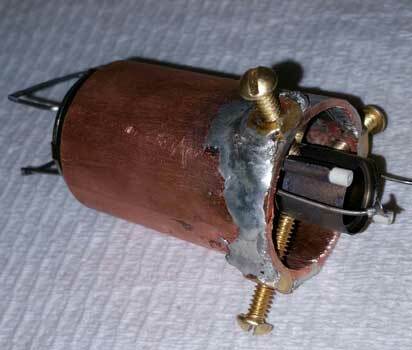 A jig will be made to hold the gun while the cathode is removed and either recoated or replaced. The CRT bench. There will be three stations here (the first two are shown). At the station on the left, the vacuum in the tube will be removed, the neck will be cut off, and new aquadag will be painted inside the neck. 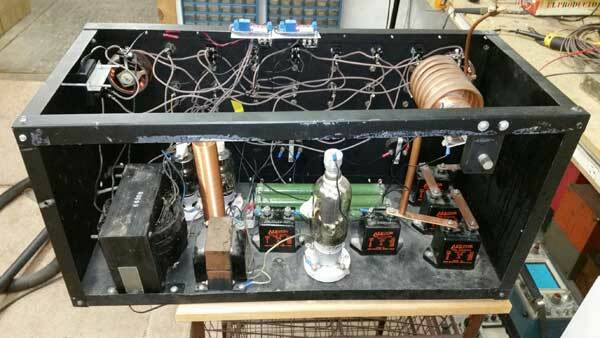 After a new gun has been installed and the tube has been evacuated in the oven, high voltage (30 KV or so) will be applied to the tube to prevent future internal arcing. Also at that station the cathode will be activated. The third station will be where the base is attached and the tube is tested. 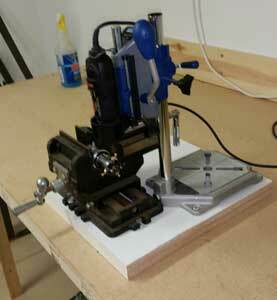 Guns: We have built a crude jig to hold the gun while the cathode is removed and re-installed. A better one will be made before we actually start work - this is only to illustrate the idea. There are two possible approaces to removing the cathode. One is the destroy the retaining ring with a Dremel tool. The other is to remove about 12 spot welds from the outside of the G1 can with a Dremel tool. Both are tedious and time consuming. There has been a lot of activity on the CRT project in the last month. We are moving toward having the facility ready for use in the near future. Oven: We have decided to use the frame from the Color Champion plant for our oven. Presently, it is 29 inches wide, so it can't accomodate the 30BP4, the largest tube we want to rebuild. We want to replace the insulation (now asbestos) with ceramic panels, and by placing them on the outside of the frame, we can increase the width to 31 inches, large enough for the 30BP4. 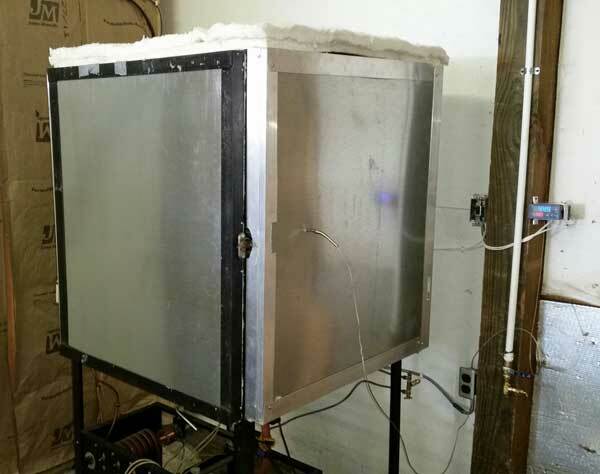 We will put two layers of 1/2 inch ceramic board on all sides, with sheet metal on the inside of the oven to protect the ceramic, and standard construction insulation (1 inch thick) on the exterior to provide additional insulation and to protect the ceramic. 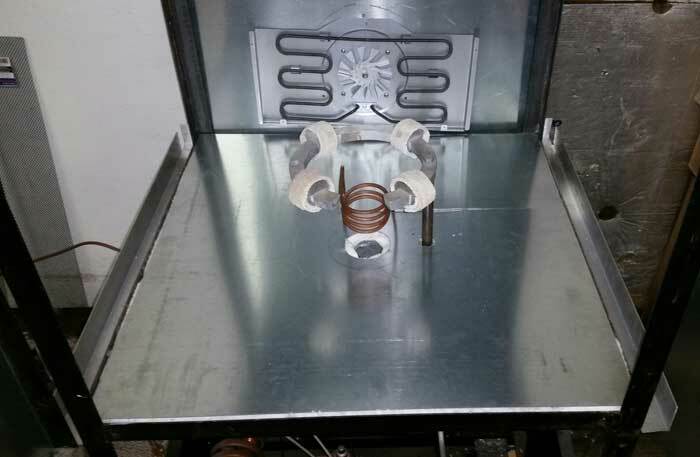 We will use a fan/heating element from a home convection oven for a heat source. The fan will circulate the air and keep the temperature consistent throughout the oven. We will buy a modern programmable thermostat to control the oven. The Color Champion has a bomber and pumps underneath the oven. We will use them, but replace the pump with one from Hawkeye. Guns: We have been exploring what options we have regarding guns for late 40s CRTs. 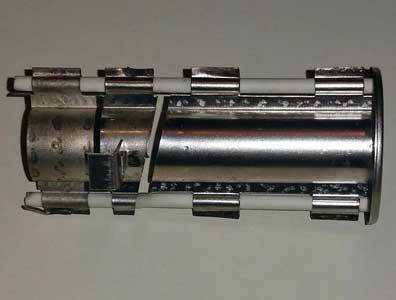 Many of these tubes use "bent' guns that require an ion trap. Replacement guns are not available, so we are left with two choices. First is to use straight guns. A limited quantity of these are available, and maybe more will be found. With this approach we will have to re-phosphor and aluminize the tubes. We will be getting the equipment to do this from RACS, but the use of chemicals will introduce problems with disposal of waste water and maybe EPA issues. The second option is to rebuild the existing guns. This seems like a better option, since we have an unlimited source of guns and avoid the chemical issue. We have been exploring what is involved in rebuilding these guns. There are two approaches. One is to remove the old cathode/heater assembly and replace it with a new one (they are available). The other is to remove the old cathode, re-coat the surface, and re-install it with a new heater. Removing the old cathode assembly is not easy. 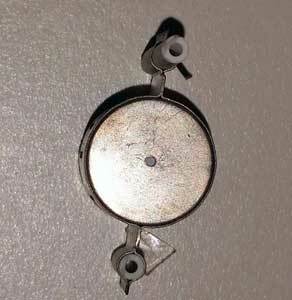 It is held in place by a metal ring, which must be cut using a dremel tool and diamond bit. The ceramic (or glass) supports for the gun elements are fragile, so a jig will have to be made to hold the G1 assembly of the gun to work on it. 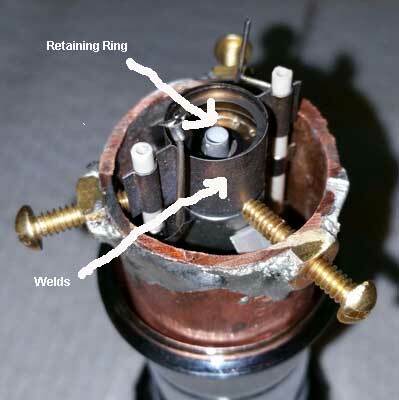 Once the ring is removed the re-coated or new cathode assembly can be installed. 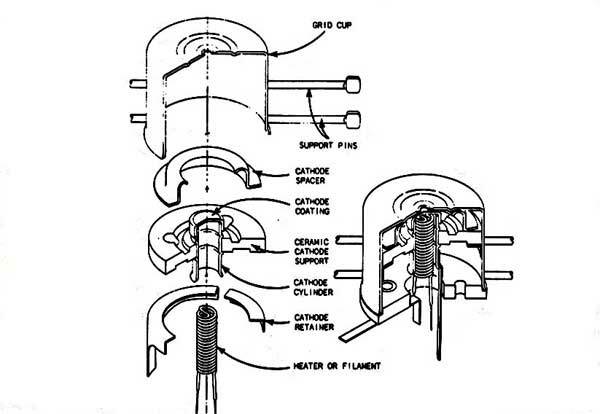 Spacing between the front of the cathode and the end of the G1 is critical and determines the cutoff voltage of the CRT. So if a new cathode is installed, a spacer of the appropriate thickness must go in the G1 housing before the cathode is put in. With a recoated cathode, the original spacer can be used, but the coating must be the proper thickness. With either approach a new retaining ring will be required. We will continue to work on this problem. The goal is to come up with a rebuilding method that will be simple enough to allow us to rebuild common CRTs at a cost that collectors can afford. 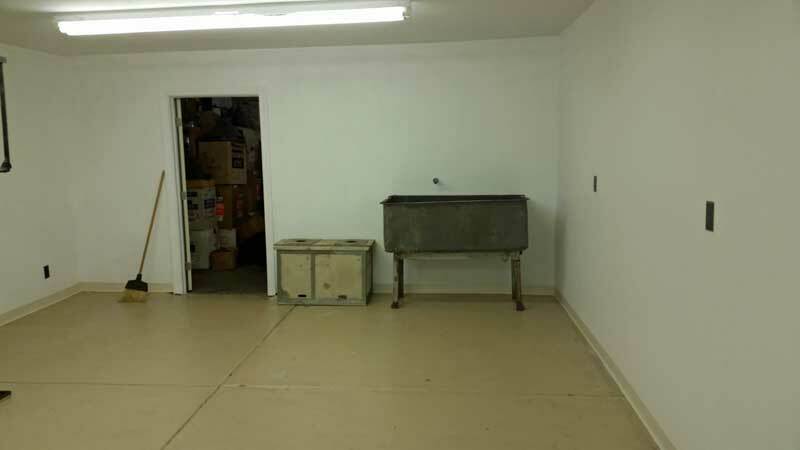 The Rebuilding Room: We have completed the painting and have installed two workbenches, one for tube work (12 feet long) and one for gun work (8 feet long). We have installed Scotty's spot welder on the gun bench. 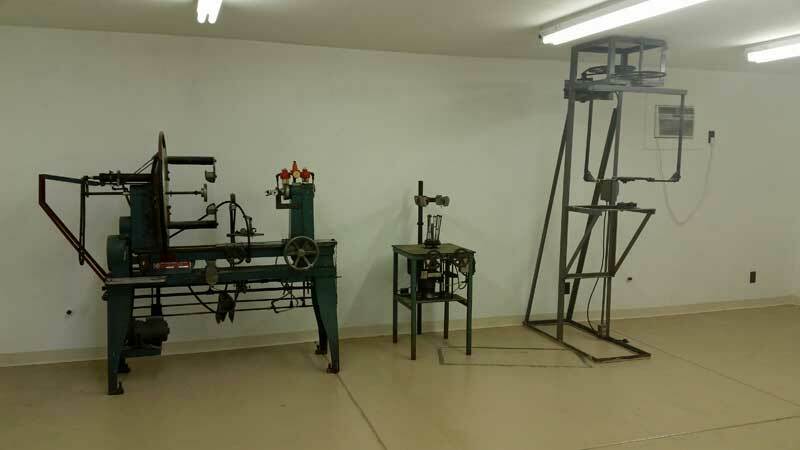 Scotty used the horizontal lathe for welding tubing to the CRT neck, the short vertical lathe for installing the gun, and the tall vertical lathe only as a frame to hold the CRT while doing certain procedures. We will install the two oxygen tanks we have on the lathes. The painting is finished, and today we moved the equipment in. 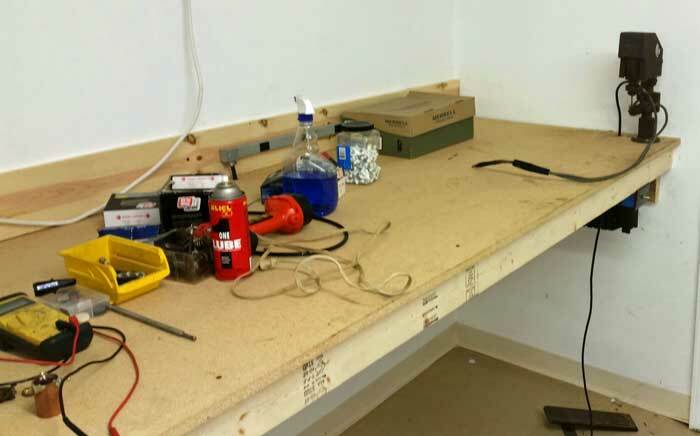 We still have workbenches to build, shelves to install, and the gas line to connect. Thanks to John Estep for his help today. The next project is building an oven. We will wait until John Yurkon is finished with his project and then build an oven similar to his. 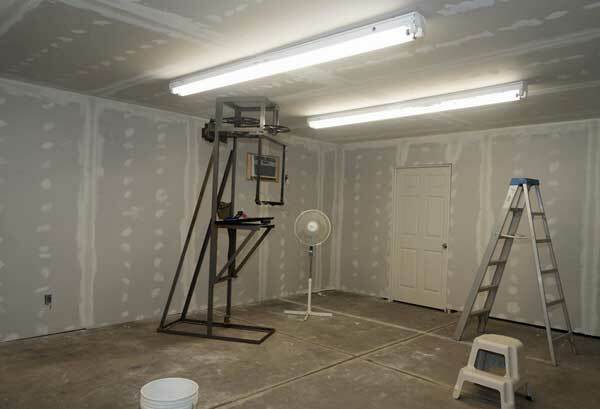 Walls and ceiling of the CRT rebuilding room have been painted. Next is the floor. We will schedule a day sometime this summer for volunteers to install the equipment and finish the construction. 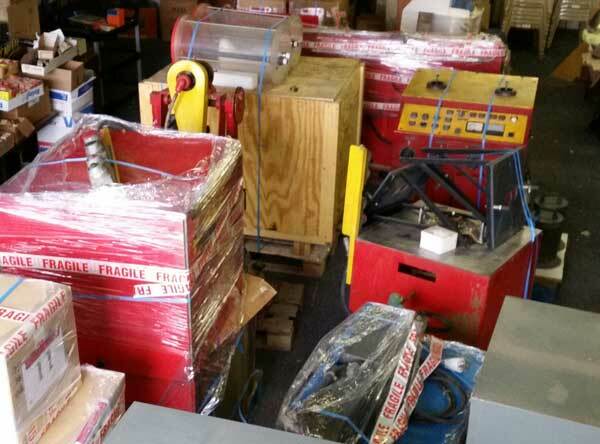 We are still waiting for details of a quote that RACS received for shipment of their stuff to Ohio. We expect that shipment will happen this summer. Several volunteers worked on Friday before the convention and Monday after to finish the drywall, electrical and plumbing. In the next two weeks we will install the trim, and paint the walls and floor. Then we will move the equipment in. Another volunteer will be here soon to complete the gas line. We are stilll waiting for more quotes on shipping the RACS equipment, and for a list of items for customs. Once we have those we will select a shipper. We expect to get the equipment sometime this summer. Basically the RACS equipment will allow us to do phosphoring and aluminizing. The remaining item is the oven. John Yurkon will design an electric one, large enough for a 30BP4. Once we have an estimate of the cost, we will solicit donations to pay for it. It is our hope that collectors will be able to experiment with rebuilding tubes by the end of the summer. We have now raised enough to purchase the equipment from RACS and transport it to the museum. We are in the process of getting quotes for delivery, which should be in about a month. In addition to the equipment, the dud 15GP22s that were sent to RACS by collectors will also be shipped. Thanks to all who donated. Special thanks to Jerome Halphen, who has generously offered to purchase the RACS equipment (5000 Euros, about $6,900) for the museum. 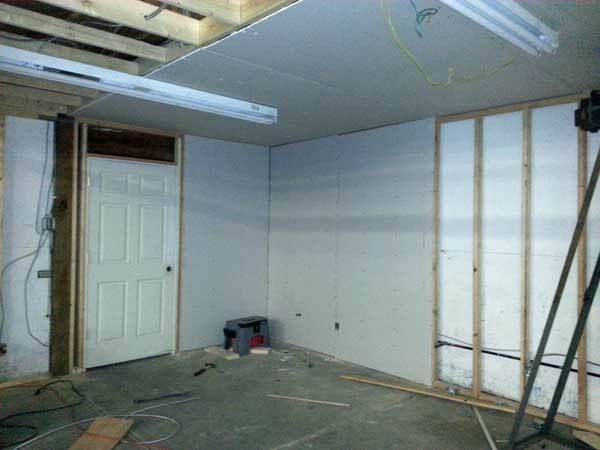 The CRT room is now ready for drywall finish. Volunteers will do this the day before the Convention. Volunteers will also finish the gas line, water line and electrical wiring. 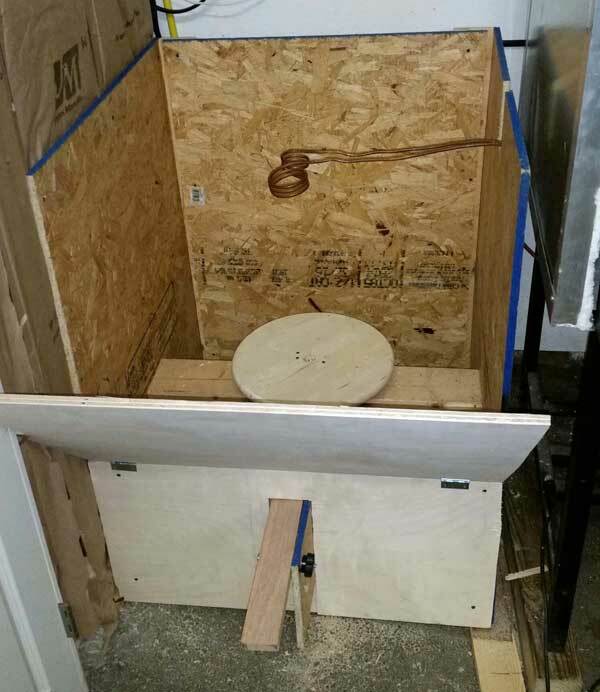 Shelves and a workbench will be constructed, and the equipment from Hawkeye will be installed. The final item is the oven. We plan to purchase the materials for the oven after the convention. If you can work on either Friday, May 15 or Monday, May 19 on any of these things, please contact us. Gas line installed, door to shop area installed, most of the electical done. 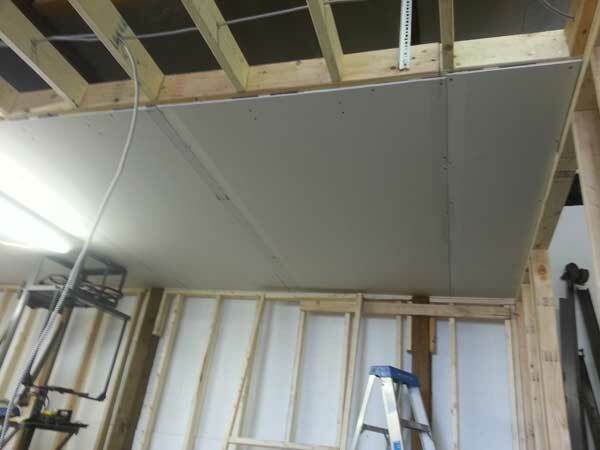 Drywall is on half of the ceiling, and we are starting on the walls. Now that I'm back in Ohio for a few weeks, I can return to work on the CRT room. Today I did about half of the ceiling drywall. 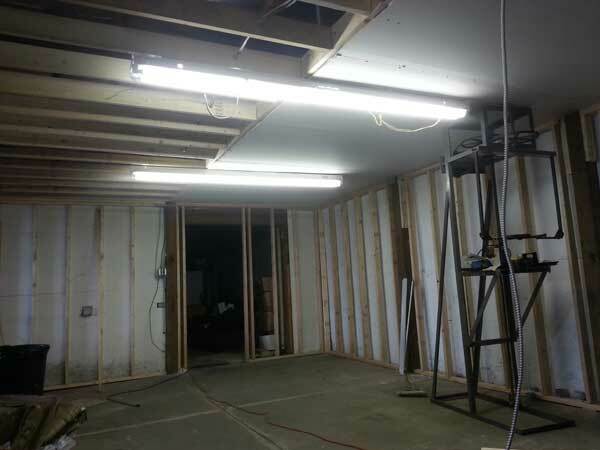 Tomorrow I plan to complete the electrical wiring and install the gas line for the equipment and the space heater. Later this week I hope to complete the drywall. Donations continue to come in, including a $50 a month recurring one from Matt D'Asaro. We have a balance of about $1,400 in the fund. 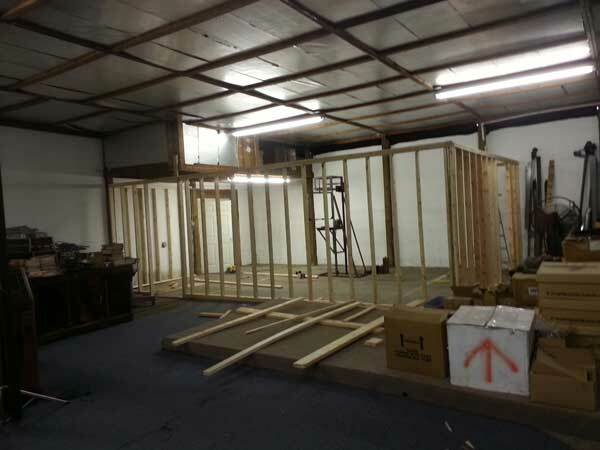 Framing is now complete, as is most of the electrical work. We started on the ceiling drywall today. 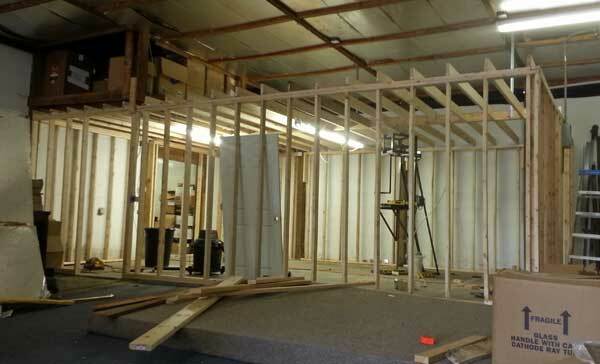 Framing is now almost complete, as is some of the electrical wiring. We expect to start drywall hanging this week. We have received two generous donations recently - $200 from Steffen Demos and $1,000 from Ralph Sargent. These should be enough to pay for the materials to complete the room. 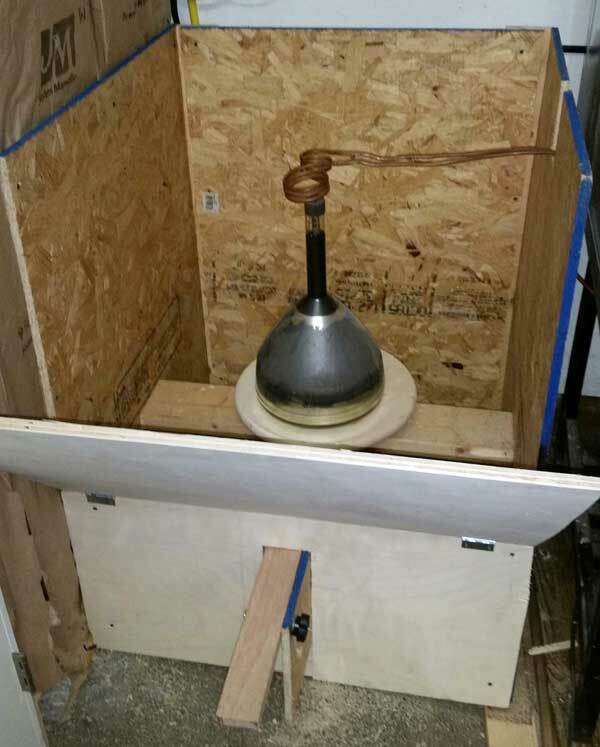 We still need to buy materials for the oven (probably around $2,500), purchased whatever guns, cathodes, heaters and getters we can find, and possibly ship some equipment and supplies from RACS in France, which has shut down. You can help by making a donation to the rebuilding project here. As of two weeks ago. Since then the ceiling framing has been completed. More framing progress. Walls are done and we are starting on the ceiling. The space above the room will be used for storage of supplies. Framing going up. the room will have two doors - the framing for one is shown, the other will be on the end at the right. It will use the existing concrete floor, and will be about 8 ft. high, finished with drywall. 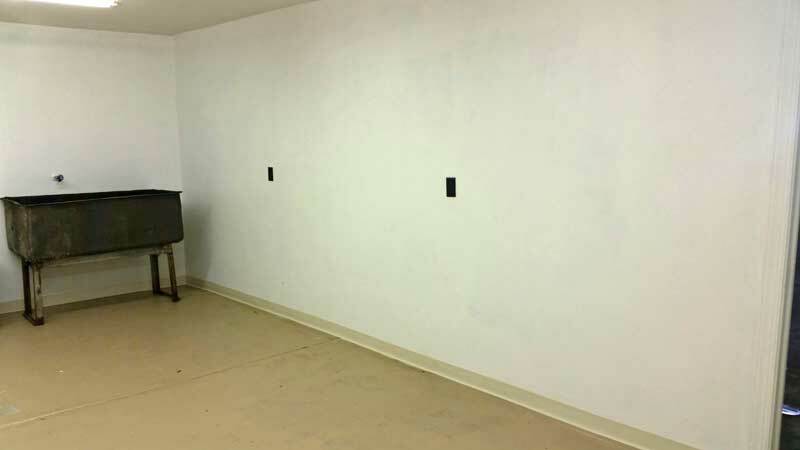 The oven will be outside the room, on the right wall. You can see the vertical lathe (behind the ladder) and the horizontal lathe (far right). The area above the room will have plywood on top of the ceiling beams so that CRTs and supplies can be stored there. The stage (foreground) will be re-assembled next to the wall when the room is finished for future conventions. We purchased a large number of guns and other materials from a person in Washington state, and had them shipped to Hilliard. The CRT rebuilding fund has $887.17 remaining in it. 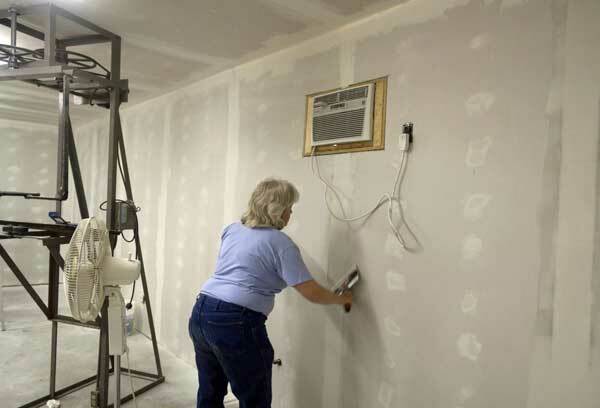 That will pay for a portion of the cost of building the room (total cost about $2500). We will need additional money to complete the room, build an oven, and buy supplies such as guns, stems and getters. We will be soliciting donations for all of this in the near future. The CRT rebuilding project is finally underway. We have begun work on the room to house the equipment we got from Hawkeye. The design is slightly different than the one proposed earlier, but will be simpler to build. We expect construction to be completed by the end of the year. We are trying to accumulate as much stock of stems, glass tubing, guns and other items as we can. Sources for many items, such as cathodes, heaters and guns, are drying up. It is important that we have enough of those critical items to rebuild many tubes. We recently purchased a large quantity of color guns and other related items from a closed CRT plant in Washington state. All of this is going to cost money, so we will be making an appeal for donations in the near future. Nick has returned from RACS, and has written a paper to describe what he learned. He has also posted videos which go through the CRT rebuilding process. 1. The main problem with rebuilding tubes at the museum remains the lack of a person or persons who will take responsibility for coordinating the project. 2. After Nick Williams returns from France (see below), we will modify Bob Galanter's layout to incorporate whatever equipment we hope to get from RACS. 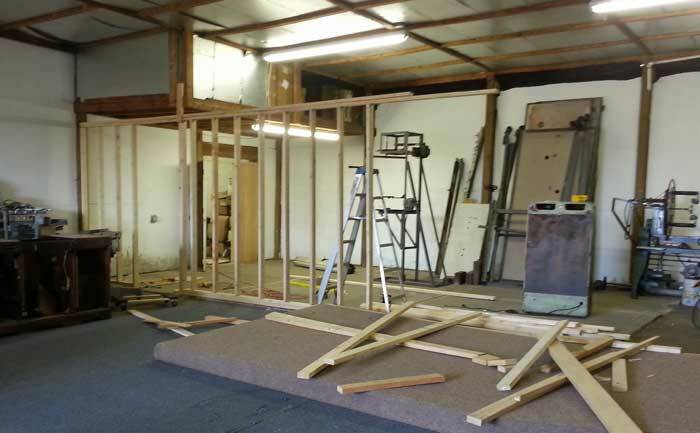 A volunteer weekend will be set up to build the room for rebuilding. Chuck Azar agreed to get a list of those who will volunteer, together with their skills. Steve McVoy agreed to make a bill of materials. There is a balance in the rebuilding account, but it is probably not enough for this project, so additional donations will be solicited. 3. It is hoped that having the facilities set up will encourage someone to step up and agree to be the rebuilding coordinator. 4. Jerome Halphen has generously agreed to pay for a trip to RACS by Nick Williams, who will learn the rebuilding process, take photos, and decide, with the help of Bob Galanter and others, what equipment would be helpful for our effort. The trailer is now at the museum Bob Dobush finally found a driver who was interested in the job. We rented a tractor from Penske, and the trailer was picked up yesterday and arrived at the museum today. We plan to unload it over the next couple of weeks, then attempt to sell it. After paying expenses for the transport, we have a balance of $1551.42 in the fund. 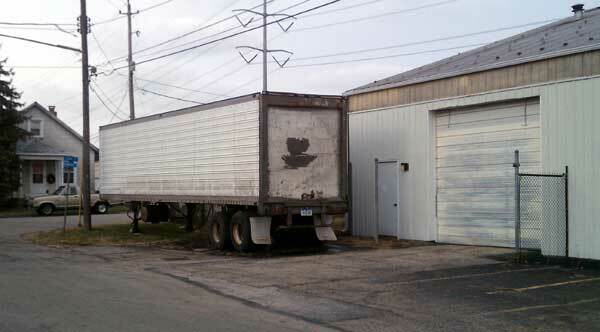 To move the equipment we have purchased a semi trailer from Scotty for $1,000, plus $300 for tires. Scotty has finished loading everything in the trailer. Bob Dobush has contacted trucking companies for quotes for taking the trailer to Hilliard. Timing depends on when we get a price for moving the trailer that is reasonable. But now that the equipment is loaded there is no hurry about gettting it to Hilliard. Bob Dobush will make a trip to Hawkeye with a van to pick up items that remain. Once we know the date of the move, we will set a weekend for unloading. We will ask for volunteers who can come to the museum on a Saturday or Sunday to help. After the trailer is unloaded, it is our plan to sell the trailer. We hope to be able to sell it for about what we paid for it. We have received additional donations, and have had no addiional expenses since the last report. As of October 2 we have a balance of $4,387.61 in the fund. Scotty has generously agreed to donate the equipment, valued at over $20,000, and Bob Dobush is willing to move the equipment (he needs help, of course). We have room at the museum to store and eventually set up the equipment. Scotty has agreed to sell us a flatbed trailer which will be loaded with all the equipment. Bob Dobush is getting quotes for having the trailer brought to Hilliard. Bob's estimate is that the project will cost no more than $3,000. An appeal to the collecting community raised over $3,400, and the move is scheduled for the end of September. Donors to the fund can be seen on that page. As of September 19 we have a balance of $3,357.28 in the fund. At the meeting on April 25, Bob Dobush (bobtheatre@aol.com) agreed to be the project leader. It was decided that the project would be divided into two steps. First, arrangements will be made to transport the plant to the museum. The largest item is the oven, which could possibly be cut up and only a portion transported. The second step will be to put together a plan to operate the plant. Many issues have to be resolved, including financing, manpower, insurance, liability and management. If an workable plan is developed, we will move forward on installing the equipment and operating it. Several people volunteered to visit Haweye before they shut down for training in operating the equipment. The traning session will be videotaped. Since the meeting, Bob has learned that Scotty will probably shut down in July, so there is more urgency in making arrangements for the transport and the training session.